I discovered this Anjaneyulu hidden behind the tulsi plant in the back of the house under the blue sky. The layers of limestone and paint applied on the wall have created a little niche for this carved stone slab. A beautiful soft hollow that has gotten smaller over the years so the corners are buried in the wall. 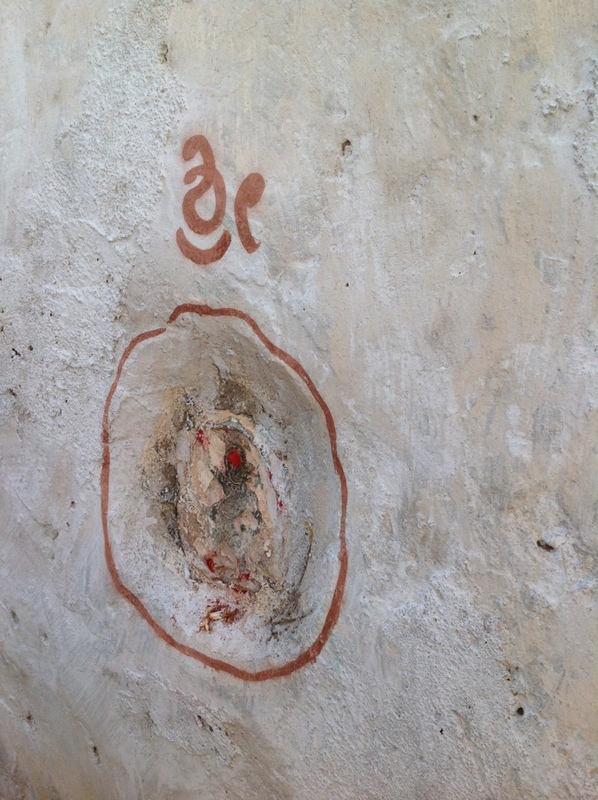 Lest you miss it they have used a red line to encircle it and the Kannada symbol for Shree is painted over it. Often i feel like that wall. A vast wall with a few tiny niches of pure energy shining through. Lifetimes of limestone, paint and grime, layer upon layer hide the core. I choose to scrub and peel away the layers. Some parts of my life melt and merge while others remain encrusted and resist my efforts. I feel the softness of the wall, the powdery delight of knowing that it will all crumble someday. This strong limestone coated wall is only 200 years old and I am as old as the ages. Little wonder that I resist. Yet I know it is only a matter of time before the wall succumbs.